Last nigh t was a great night for a campfire. If you weren’t able to make it but want to know the secret Sal shared it’s to conduct a soil test of your lawn. Our soils tend to be a little acidic so you might need to add lime. Also, selecting a hardy drought tolerant grass like tall fescue (see the photo) will ensure that you’ve got a green lawn without constant watering. 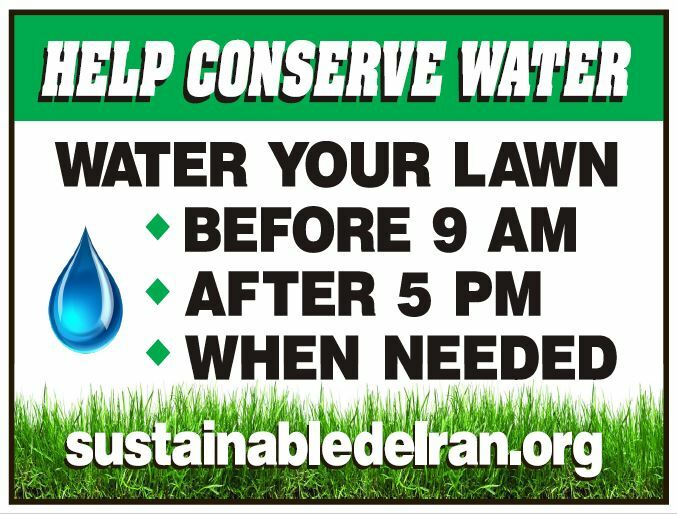 The Delran Green Team is promoting water conservation. You should be seeing signs like this around Delran. If you do water your lawn, try to do it early in the morning or late in the afternoon to maximize water getting to our lawn while minimizing loss due to evaporation. If you decide not to water, your grass may turn brown but it’s still alive and will green right up with the next rain.